TUV leader Jim Allister has called on Sinn Féin's Caitríona Ruane to resign as Stormont principal deputy speaker. The former education minister did not stand in the March Assembly election. But she has retained her role as principal deputy speaker, which attracts a salary of £55,000 - even though the assembly has not been functioning since January. But the Executive collapsed in January and Northern Ireland has been without a power-sharing government since then. There have been calls in Northern Ireland for Assembly members' £49,500 annual salaries to be cut in the absence of a functioning government. On Wednesday, the Northern Ireland Secretary said he "recognised public pressure" over the issue of MLAs' pay. James Brokenshire told Westminster's Northern Ireland Committee he would keep the issue "under examination", and would deal with it if there was no progress in talks. Mr Allister pointed out that the former UUP MLA Danny Kennedy, who lost his seat in Newry and Armagh in March, had resigned his job as deputy speaker. Calling for Ms Ruane to resign, the TUV leader urged her to repay any money she had been paid by Stormont since the election. 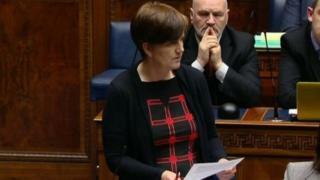 A Sinn Féin spokesperson said: "Caitriona Ruane was no longer an MLA after March this year. "Any arrangements she may have come to with the Assembly were her own affair." It has previously been reported that the SDLP's Alex Attwood, who lost his West Belfast seat in March, has retained his position on the Assembly Commission, the group that runs the assembly building. He is entitled to a salary of £55,000 but it is understood he pays back £49,500, his MLAs salary, to the Department of Finance. He retains the remaining £5,500 that he gets for being a member of the Assembly Commission. Previously, office holders at the Assembly were paid allowances in addition to their MLA salaries. However, the Independent Financial Review panel changed the rules last year so that such posts are now awarded an all-inclusive salary. Last week, a number of Stormont parties called on the DUP's Robin Newton to resign as Assembly speaker after revelations by the BBC Spotlight programme about his links to a UDA-linked East Belfast community group, Charter NI. Mr Newton remains the Assembly speaker, with an annual salary of £87,500, even though Stormont is not operational.